The wood frog,Rana sylvatica, can survice extracellular freezing during overwintering. Under laboratory conditions freezing occurred at about −2°C and animals survived several days at −6°C. Frogs accumulated glucose as a cryoprotectant; glycerol, sorbitol and other sugars were not produced. Average levels of glucose in frozen antimals were 185±40 μmol/ml in blood and 387.8±44.8, 198.3±27.3, 120.8±14.1 and 26.5±2.7 μmol/g wet weight in liver, heart, kidney and leg muscle, respectively. Two methods of cold acclimation, 11 weeks at 3°C or a 1°C per day decrease in temperature from 23°C to 0°C, failed to stimulate an anticipatory rise in glucose levels. Only direct exposure to subzero temperature between 0°C and −2°C stimulated synthesis. Glucose synthesis appeared to be confined to liver with glucose distributed through the blood to other tissues. Freezing exposure resulted in a decrease in liver glycogen content of over 700 μmol/g wet weight while glycogen content of other tissues was not affected. Activities of 17 enzymes in liver and leg muscle were monitored in control and freezing exposed frogs. Freezing exposure increased liver phosphorylase activity by 520% from 3 to 18.6 units/g wet weight and increased phosphorylasea content from 37 to 80%. Freezing also elevated glucose-6-phosphatase activity by 140%. Activities of most other enzymes in liver increased by 30–90% with freezing exposure. 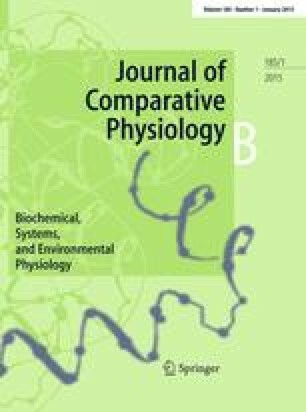 Activities of phosphorylase and glucose-6-phosphatase increased in leg muscle with freezing exposure although phosphorylasea content remained at 35%. Freezing exposure resulted in the accumulation of lactate in all tissues. Both total adenylates and adenylate energy charge decreased in liver during freezing. In leg muscle adenylates were unaffected but creatine phosphate reserves were depleted.